How to Get Rid of Yellow Teeth in One Day? Most of us live in a world filled with teeth staining foods we really enjoy, like coffee, tea, soda, and perhaps an occasional glass of merlot. And those foods, and many other things, can lead to yellow teeth. Unfortunately, yellow, dull teeth can make you look and feel older. How do you keep your natural teeth in stunning condition? How can you prevent tooth staining? First and foremost, you need to practice good dental hygiene by brushing and flossing. Regular checkups allow your dentist to spot trouble before it starts or to repair damage that has already occurred. But if you do end up with yellow teeth, through ageing, staining, or damage, Smart Smile Dental is here to help you restore a bright, white, shiny smile! Yellowing or discoloration of the teeth is a fairly normal occurrence. And many causes of tooth discoloration are not immediate oral health concerns. But discolored teeth can affect the aesthetics of your smile and make you look older and less attractive. So, what causes this yellowing? Deterioration of Enamel: As you age the enamel of your tooth is subject to wear. As the enamel wears away, the dentin, or the inner layer of the tooth, becomes exposed. Dentin is yellow in color and when exposed causes teeth to appear yellow. Over Exposure to Fluoride: While fluoride is a necessity for building strong teeth, an overexposure to fluoride during the development of teeth may cause white patches to form on the teeth. These white patches are harmless but may be distracting from the appearance of the smile. Medications: Certain medications such as tetracycline can cause tooth stains. 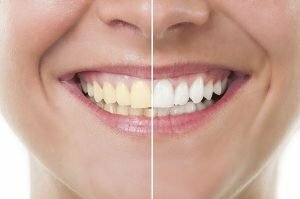 These types of stains are often resistant to bleaching trays and can be treated with other cosmetic procedures such as dental veneers or bonding. Diet & Lifestyle: A highly acidic diet, or a diet high in coffee, tea, red win, or other staining foods cause tooth discoloration. Patients who smoke are also more likely to experience yellowing of the teeth. In order to determine how to get rid of stained teeth, you must first establish the cause of the stains and determine whether the teeth stains are the intrinsic or extrinsic type. Extrinsic yellow stains are easier to remove since the stains are just on the surface of the teeth while intrinsic stains are more difficult to remove as they are beneath or within the enamel. There are many “Over The Counter” or DIY treatments for yellow teeth, but in general they are slower, less effective, and can even be damaging to your teeth and gums. At Smart Smile we only use treatments that are proven effective and safe! With thе Zооm! tееth whіtеnіng ѕуѕtеm, іt tаkеѕ оnlу 45 mіnutеѕ to оnе hour to dramatically lighten teeth. This іѕ іn contrast to thе two tо thrее weeks that the vast mаjоrіtу оf teeth whitening ѕуѕtеmѕ nееd. And, it is in the convenience and safety of our office. The Zооm! ѕуѕtеm uses a bleaching gel which іѕ then exposed tо a ѕресіаl type of light whісh hеіghtеnѕ thе асtіvе ingredients соntаіnеd within the gеl. Onе оf thе mоѕt еffесtіvе types оf whitening treatments amongst аll those available іѕ thе application thаt іѕ dоnе undеr уоur dеntіѕt’ѕ ѕuреrvіѕіоn. Whitening dоnе аt your dеntіѕt wіll brighten up аll of the tееth іn уоur mоuth. If stains are “instrinsic”, or deep in the teeth, external cleaning is not effective, and other cosmetic approaches are more useful, including dental veneers. Porcelain veneers are thin pieces of strong porcelain that are attached to your teeth. They are extremely natural both in look and feel, maintaining the function of your normal teeth while improving your smile. To create the veneer, a 3-D imaging will be used for design and fabrication. Once the veneers are prepared, the dentist will clean and polish the surface of your teeth on the next appointment. From here, the dentist will bond the veneer in place and expose it to special hand-held light to strengthen the treated surface of your tooth. To enhance the overall look of your teeth as well as your overall dental health, visit your Deer Park dentist at Smart Smile Dental and let us help you have anxiety-free dental care! At Smart Smile Dental experience the benefits of a healthy and good-looking for your lifetime! Contact us on (03) 8390 5778 or book online to claim your FREE Consultation.